This week I audited a lecture given by the lead professor of a big mechanical engineering course that I’m involved in. I was there to signal my interest and get some information on an upcoming assignment. At some point, the students were prompted to draw a human-powered hovercraft. I was sitting next to another communications lecturer, Mary, and we looked at each other, as if to say, Are we gonna do this, too? After all, we don’t draw — we write, we speak, we teach. And yet, we were there. So, we gave it a whirl, too. Anyway, mine is powered by a jolly human who steps up and down on resistance pedals, like on a stair master. The action of the pedals somehow fills a series of air bladders, which collect compressed air, and then force the air, incrementally, down into an air reservoir. The air forcefully puffs out of an array of pores, which creates a cushion of air between the craft and the ground. I certainly felt humbled by doing the exercise — what I can’t draw, what I don’t know — but I also, by drawing, thought much more deeply about the challenge than I would have if I had just watched the students in the class draw. It was a good chance, actually, to be a student myself for an hour. And rudimentary as my drawing is? Once I submitted to the spirit of the task, making it was fun, like being 12 years old and building a fort with the neighborhood gang. Rich, my neighbor — husband of Julie, father of Georgie, and looker-alike of this guy — walked by and asked me if the sunflowers were ready to be harvested for seed. However… “I decided not to harvest them,” I replied to Rich, “and that I’d leave them for the wildlife.” I told him about a Downy Woodpecker and other birds that were feeding obsessively on the seed heads. 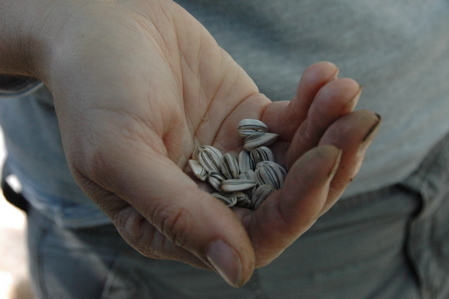 The two of them went to work, cutting down mostly spent sunflowers and cracking open the seed heads. – If only we could go back, if only! In a conversation about Ted Kennedy’s death and the Massachusetts response, James asked me about what he called my “JFK Jr. project,” a piece on the summer of 1999, when I became scarily obsessed — unusual for me — with the story of the crash of the plane piloted by John F. Kennedy, Jr. and carrying his wife Carolyn Bessette and her sister Lauren. Earlier this summer, I drafted an essay and then shortened it into a script for a digital story. I recorded it, with help from Anthony Sweeney, in a workshop conducted by my MIT friend and colleague, Lisa Dush, who runs Storybuilders. Later, I edited it in Audacity. It’s about 4 minutes long, and you can listen to it by clicking the SoundCloud arrow. If you prefer reading, you’ll find the text of the story after the jump. 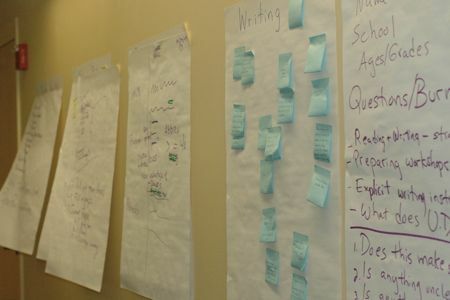 In the first few moments of her three-day workshop, Supporting Reading Comprehension, Writing, and Study Skills at the Landmark College Institute, Linda Hecker prompted participants (I was one of five) to introduce ourselves and say why we came. When it was my turn, I answered that I wanted to learn and develop more explicit teaching methods, to help not only my students with learning disabilities, but all students I work with. We were invited to tell the story of a student, and I talked about A., who, when I very clearly proposed to him an alternative structure for his paper, said to me: “I understand what you mean, but I don’t know how to do what you’re saying.” I’d like to know, I said to Linda and the group, how to teach better those students who don’t intuitively know all the little steps involved in tackling a big writing task. What’s involved, for example, in summarizing a passage or chapter? I know how to summarize — but do I know how to teach the same skill? In the workshop, I did learn a strategy for teaching the summary, and picked up a few tools as well. Landmark emphasizes multimodal teaching, which engages a student aurally, visually, and kinesthetically in learning. Even though their faculty have developed this kind of teaching to reach students with learning disabilities and AD/HD, this pedagogy is applicable to all learners. Indeed, after three days at Landmark, I wanted to try out some of these exercises and tools not only on students, but on my own reading and writing practices. They’re more than effective — they seem motivating and, dare I say, fun. This is what hope looks like. During a spring semester clouded by the recession and my own economic downturn, I forced myself to take on tasks that were both optimistic and doable. I tended to my students and their work; I cultivated ties to colleagues and friends; I hoed the already neat rows of my resume; and I scattered queries for teaching jobs. Along with my helpers Grace, Jimmy, and George, I stuck those seeds in the dirt only 10 days ago, on May 10th. It’s too soon to tell whether the folly will be a success. Amazingly, however, there has been an unexpected bounty on the teaching front: I’ve been rehired, as funding to the MIT writing program has been restored for the coming year. And I am so… HAPPY! I feel the way I expect those sunflowers to make me feel when they bloom in August. – Good use of time? 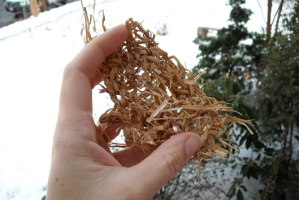 Without the energy to start a new knitting or sewing project, much less decide on one, I experimented on knitting the same thing — a small leaf — in different materials: yarn, wire, plastic bag shreds, and dried grass. The straight-up yarn leaf in marled red came out pretty nice, and it’s in the banner photo above. With me, Grace sat and clicked her needles, too. She has a few projects going on, all in yarn. (She loves beginnings. Me? I like finishing.) She admired my yarn leaf and even the one done up in green plastic, from loops I had cut from a grocery bag. “I don’t think so,” I replied. “Why are you doing it? It doesn’t even look good!” Grace smiled; I know she loves me. 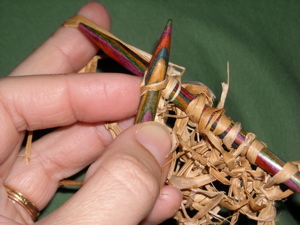 I learned that grass is difficult to tie together securely, although not difficult to knit, albeit with care. Furthermore, odd textiles do not always make for odd beauty — sometimes the result is just a wicked mess. I also was reminded that the mind makes interesting associative leaps while the hands are busy. The needles and my fingers seems like a convergence of beaks; I was a bird among birds, building a nest. For eggs. For baby birds. Or for baby Moses, in his rush basket on the Nile River, with his sister Miriam watching him. 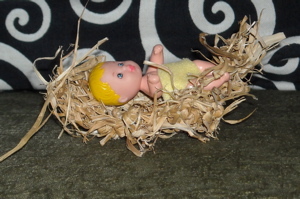 Or baby Barbie, in his knitted leaf nest on the green chair, with Jane photographing him. In response to my School Bag Meme, Emily, Rosemary, James, Dr. Poppy, Jan, and Alex posted the contents of the bags they carry to and fro work every day. (Thank you, friends and sis!) Add their contents to mine, and you get this wordle — kind of a census of the things we seven carry. I constrained wordle to compile the top 75 words, so some of the more idiosyncratic items dropped out. Still, fascinating the nouns and modifiers that remained. Compartment. Green. Dry. Always. Paris. Gum. Hair. Never. Bottle. Wireless. Papers. And Jan’s lovely rosary, up in the top left corner, near the essential chapstick. There are many things that could be done in a day. There are many things that will not get done. Choose one of each; others will follow. Thank you to my shower, which gave me this thought. This is a cool way to kill, I mean spend, some time. Copy and paste the text of your c.v./resume into Wordle. The Wordle tag cloud might teach you something about yourself, or remind you of stuff you already know. Every word in my December ’07 resume makes the cloud below. (Collaborators, you’re in there, too!) Most repeated words are biggest. From memory, I would have said that “whale” or “dive” would be among the prominent words in Behn’s poem. But, look at this: “turn” and “fathoms” and a few others are most recurring. P.S. Thanks to Jimmy for the heads up. It’s nice that there is still room in life for firsts, even though so many of the firsts are way behind me. I’ve been tagged. While I don’t feel a frisson exactly, I do feel a little flutter. Yes, I’ll dance to this meme. Here is my list of eight things about me. 1. I was born in Massachusetts; I went to college in Massachusetts; and I have lived my adult life in Massachusetts. I feel self-conscious about this sometimes, as if I have failed to do some adult thing that most adults do, that is, move away. At the first meeting of my class last week, I asked the students to say where they’re from, what they do at MIT (where I am newly teaching), and what makes them them. The 17 students in my group hail from across the U.S. and the globe: Texas, China, Ohio, California, Thailand, Tennessee, Korea, New York, Mauritius, and Florida. I am the only person in our group from Massachusetts. 2. My four brothers and sisters — Michael, Sally, Emily, and Brian — all live in the 617 area code, as I do. You could say we are clannish. 3. I only like vegetarian and cooked shellfish sushi. No tuna or octopus for me. 4. I prefer novels by the Brontes to ones by Virginia Woolf. 5. I’ve never had a celebrity crush on the lead singer (Mick, Bono, Bruce, etc.). I have always liked the guitar player (Pete Anderson) or drummer (Charlie Watts). 7. Although I am neutral when it comes to animals, dogs seem to like me immediately, crawling into my lap shortly after meeting me, and cats seem to hate me immediately, attacking me even unprovoked. 8. When I was in high school, I sent some poems to Seventeen magazine, and the editor wrote a personal note back to me on the rejection form letter. These are good, but too complicated and dark for our readers. It was a compliment, and I took it as encouragement. One poem was about the peeling of rose petals away from the bud and the speaker’s disappointment of discovering, when she got to the absence at the center, that she had destroyed beauty and found nothing. In turn, I tag my people Brian, Jimmy, Ave Lydia, Marcia, and Laura, and also Lee Houck, whom I don’t know, because I like his blog and chapbook. 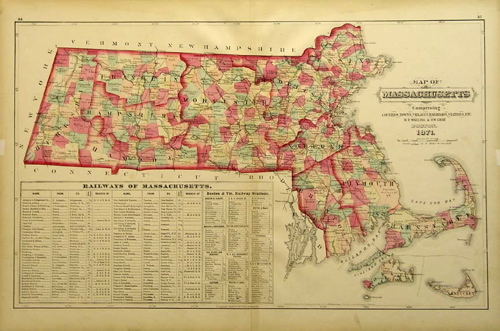 The image of the 1871 Massachusetts map is via Grace Galleries. Thank you.